Use theories to explain natural phenomena—the concept of energy flow explains the limited length of food chains. Energy flow is governed through the laws of thermodynamics. The first law (and I’m paraphrasing) essentially says that energy cannot be created or destroyed but merely transformed from one form to another. The second law (the one about entropy) says that energy transfer is never 100% efficient and some energy is always lost as heat, which can not be regained or reused. Therefore, in a food chain, light energy is transformed into chemical energy by producers and then into additional chemical forms as it passes through to consumers. As energy is being transformed at each trophic level, some of this energy is lost to the system (mostly as heat from respiration, but also in the form of undigested parts, excretion etc). Thus while the total energy remains the same as the amount put in by the sun, the amount that is actually available to consumers decreases with each increase in trophic level. We use the figure of 10-20% as a rough rule of thumb – that is, at each successive trophic level, only 10-20% of the energy from the previous level is available. So 10% of the energy in a producer is available to a primary consumer, but only 10% of this energy is available to a secondary consumer – 1% of the original energy in the producer. Thus the higher the trophic level, the less energy is available and the limited length of most food chains and why many organisms can function at multiple trophic levels. Use theories to explain natural phenomena—the theory that hydrogen bonds form between water molecules explains the properties of water. Theories in biology are explanations for how the natural word works. They can be broad statements that incorporate facts and laws and must be testable through experimentation or observation. In our everyday conversation we may use theory as a synonym for “educated guess” but in the scientific context theories are far more rigorous and comprehensive. We can use a pipette to pile drops of water onto a coin. The water does not spill off immediately but piles higher and higher. With great care, we can float a paper clip on top of a glass of water. Adding a drop of detergent causes the paperclip to immediately sink. If we heat and cool samples of ethanol and water, the water heats up more slowly, boils at a higher temperature and cools down more slowly than the ethanol. Observations in the natural world, such as insects that seem to walk across water or the absorption of water by a plant add to the idea that water appears to be a rather unusual liquid and must have particular properties in order to explain these features. Based on our observations and experiments, we need to review other scientific theories and ideas to help develop a theory – in this case, atomic theory and the properties and behaviour of electrons. This then develops into a coherent theory explaining our observations and results as a consequence of hydrogen bonding that takes place between water molecules. We cannot “see” a hydrogen bond and cannot prove absolutely that they exist. However, the theory of hydrogen bonds and how they function explains all of the above observations and more about the properties of water and has withstood experimental and observational testing. We can accept this (or any) theory as correct if there is evidence for it, if it has predictive power, if it has not yet been falsified, and if it explains natural processes. Allott, Andrew, and David Mindorff. Biology: Course Companion. Oxford, Oxford University Press, 2014. Gould, S.E. “Hydrogen Bonds: Why Life Needs Water.” Scientific American Blog Network, Scientific American, 6 Aug. 2013, blogs.scientificamerican.com/lab-rat/httpblogsscientificamericancomlab-rat20110802hydrogen-bonds-why-life-needs-water/. Accessed 20 Apr. 2017. Purvis, David. “Water Drops on a Penny.” Dr. Dave’s Science, 2015, drdavesscience.com/free-science-activities/. Accessed 20 Apr. 2017. VILLANUEVA, A. “Floating Paperclip on Water.” Understanding Biology, Blogspot, 27 Jan. 2010, understanding-biology.blogspot.com/2010/01/floating-paper-clip-cohesion-surface.html. Accessed 20 Apr. 2017. Falsification of theories—the artificial synthesis of urea helped to falsify vitalism. It was particularly associated with the idea of a vital force that provided the “spark” of life separating the living from the non-living. In 1828, the German chemist Friedrich Wöhler synthesised organic urea from inorganic cyanic acid and ammonium. Although it is now doubted that Wöhler expressly set out to falsify vitalism, his results nevertheless showed that organic molecules can be produced without the need for a non-specific “force” – providing an important milestone in understanding quantitative chemistry, isomerism and biochemistry. As a scientific theory, Vitalism fails on two principal fronts: it offers no predictive value and there are no tests or experiments which could be used to demonstrate its existence or function. Bechtel, W. and Richardson, R. Vitalism. mechanism.ucsd.edu. 1998. Web. May 24, 2016. Kinne-Saffran and Kinne R.K.H. Vitalism and Synthesis of Urea: From Friedrich Wöhler to Hans A. Krebs. Am J Nephrol 1999; 19:290–294. Falsification of theories with one theory being superseded by another—plant families have been reclassified as a result of evidence from cladistics. The use of DNA sequences to classify organisms has been an important breakthrough in classification. Previously, species were classified primarily on morphology (physical characteristics), which works some of the time but is less useful in other situations. Thus seemingly unrelated organisms have been grouped more closely together and those that were thought to be very closely related have been found to be more distant. Carl Woese used gene sequencing to not only overturn the existing dogma of the 5-Kingdom system, but to also propose that Archaea are more closely related to humans (eukaryotes) than to other prokaryotic bacteria. This was a major paradigm shift in microbiology and has since been recognised as “…one of the 20th century’s landmark achievements in biology…” by Dr. Nigel Goldenfeld (“Carl Woese | Carl R. Woese Institute For Genomic Biology”). In another example, the Figwort family of flowering plants, underwent a dramatic recent reclassification. The figworts were a large family classified under the family Scrophulariaceae and included the popular snapdragons and foxgloves. Using three genes found in the chloroplast, researchers were able to determine that there were significant differences in lineage and so an entire family had to be reclassified into six families. See Olmstead et al. (2001), full text available online, for the full scientific story. The monkey flower is a traditional snapdragon to many people, but is now in a more obscure family – the Phrymaceae. Cladogram representing changes to the classification of the snapdragons. Olmstead et al. (2001). n.a. ” Carl Woese | Carl R. Woese Institute For Genomic Biology”. Igb.illinois.edu. University of Illinois, 2016. Web. 25 Apr. 2016. Essig, F. “Whatever Became of the Snapdragon Family?”. BotanyProfessor. Botanyprofessor.blogspot. April 5, 2012. Web. April 25, 2016. Olmstead, Richard G., Claude W. dePamphilis, Andrea D. Wolfe, Nelson D. Young, Wayne J. Elisons, and Patrick A. Reeves. Disintegration of the Scrophulariaceae. Am. J. Bot. February 2001 88:348-361. Web. Accessed April 25, 2016. In 1964, the US Public Health Service published a report on the links between smoking and health that has since been recognised as a turning point in public health. The conclusion of the report was clear: “Cigarette smoking is a health hazard of sufficient importance in the United States to warrant appropriate remedial action.” (Dela Cruz, C. S) This was based in large part on two large-scale epidemiological studies completed in 1950. One study, in the US, found that 96.5% of lung cancers in a study group of 605 patients were in men who were moderate to heavy smokers for many years (Wynder and Graham). The other, in the UK, found an association between lung cancer and smoking cigarettes and between cancer development and the amount of smoking (Doll and Hill). Additional research establishing the nature of the 50 carcinogens and 400-500 major constituents of cigarette smoke provided the supporting data to establish this causation (Dela Cruz, C. S). It is now estimated that a heavy smoker has between a 10-30 fold greater risk of developing lung cancer than a non-smoker (Dela Cruz, C. S). Now, this is not meant to be a History of Science section, or a study of epidemiology, but an analysis of the Nature of Science. So what can we determine from this? Well, Theories are the backbone of science, establishing explanations for observable phenomena that are supported by experimental data and evidence. Until such evidence was established, tobacco companies could brush aside health concerns because of a lack of data – it could be genetic, environmental, the product of other health concerns etc etc. Large scale studies that established causal links between cigarette use and lung cancer determined that smoking was the key cause and thus public health policy and laws were able to move in the direction of reducing smoking. The graph above shows the dramatic effect that the studies outlined above had on smoking, as well as on social and legal factors such as taxes and bans on advertising. One could extend this aspect into some TOK-territory by examining advertising and cigarettes: Australia has some of the most restrictive laws regarding cigarette packets and warnings, which could lead to some interesting knowledge questions. Ultimately, it is the collection experimental data that leads to the formations of theories which can then be used to explain observations. The power of science is that these theories can then be used to support legislation to protect the public against powerful interests. Dela Cruz, Charles S., Lynn T. Tanoue, and Richard A. Matthay. ‘Lung Cancer: Epidemiology, Etiology, And Prevention’. Clinics in Chest Medicine 32.4 (2011): 605-644. Web. 4 Dec. 2015. Doll, Richard, and A. Bradford Hill. “Smoking and Carcinoma of the Lung.”British Medical Journal 2.4682 (1950): 739–748. Print. 6.2 Theories are regarded as uncertain—William Harvey overturned theories developed by the ancient Greek philosopher Galen on movement of blood in the body. This NOS highlights the advancement of knowledge in biology (and the Natural Sciences) – new discoveries, led by advancing technology or new insights, leads to previous theories being overturned as we develop new understandings. Galen of Pergamon was a scientist and philosopher in the second century AD and provided the first systematic explanation of the circulatory system. Galen was highly educated for the time and an accomplished physician and based his conclusions on some experimental work and deductive logic. He was on the right track in some places – structural and blood differences between veins and arteries, the heart is myogenic, arteries contain blood (not air) – but was clearly wayward on many other key points. His central premise – that blood is continually produced and consumed by the body – was to undermine faulty medical practices for over a thousand years in Europe. Harvey, a 17th-century physician, identified that if blood were to be consumed, the liver would have to produce many times a person’s body weight in blood each day, something that did not seem possible. He also identified that veins and arteries were connected in a circuit, circulating the same blood between them. Harvey’s work was based on a range of experiments and observations, including applying ligatures to arms to compare the flow of blood through arteries and veins and to establish the role of valves and some live experimentation on the hearts and vessels of fish and snakes. Harvey’s work is often regarded as the basis of modern medicine, yet it was ridiculed in his own lifetime. In fact, he became a recluse after publishing his work, not wanting to attract any more attention to himself. This is often seen when long-standing dogma is threatened by new ideas. AIRD, W. C. ‘Discovery Of The Cardiovascular System: From Galen To William Harvey’. Journal of Thrombosis and Haemostasis 9 (2011): 118-129. Web. 18 Nov. 2015. Bbc.co.uk,. ‘BBC – GCSE Bitesize Science – Circulatory Systems And The Cardiac Cycle : Revision, Page 5’. N. p., 2015. Web. 18 Nov. 2015. Busch, Georg Paul. Portrait of Galen. Photograph of original from The Lancet. Wikimedia Commons. Accessed March 15 2018. Membercentral.aaas.org,. ‘The Circulatory System, From Galen To Harvey | AAAS Member-central’. N. p., 2015. Web. 18 Nov. 2015. Mijtens, Daniël. Portrait of William Harvey. National Portrait Gallery, London. Photograph original, 2012. Wikimedia Commons. Accessed Mar 15 2018. 1.5 Testing the general principles that underlie the natural world—the principle that cells only come from pre-existing cells needs to be verified. If Cell Theory tells us that all cells come from pre-existing cells, then where did the first cell come from? What a wonderfully intriguing question! What is the origin of life? This is a topic that dovetails nicely with TOK, as it helps establish the process by which the natural sciences develop knowledge. Although we cannot, of course, travel back to the early years of the earth, we can develop hypotheses and test them experimentally, discarding those for which the evidence does not support. I think this NOS is also important because it emphasises that biologists can attempt to answer even the most perplexing questions through the scientific process. Pasteur demonstrated that new cells could not spontaneously arise – they must therefore develop from existing cells. 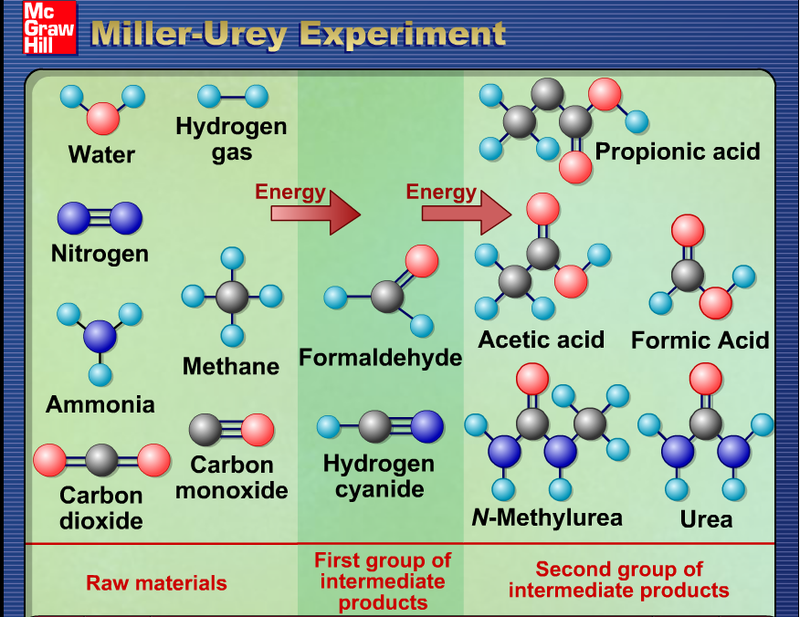 Urey and Miller demonstrated that inorganic compounds could become organic under the right environmental and atmospheric conditions. And, my favourite, the endosymbiotic theory – we all have prokaryotes inside us! Ongoing research, demonstrated in the excellent Exploring Life’s Origins website, provides evidence of how protocells and membranes may have evolved. It all fits rather nicely with the new Crash Course Big History series, of which episode 5 is on the origin of life.